I recently visited "All About Watches" a watch store located in northwest Atlanta's Cumberland Mall (just inside the Perimeter at I-75 & I-285 near the Cobb Energy Center). 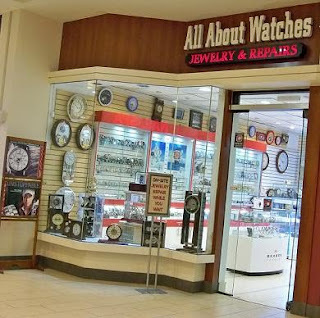 The store offers while you wait jewelry repair services and I had a couple of special watches that I wanted to get serviced. I got a couple of links taken out of a Bulova watch band and a battery replaced on a Seiko in about 20-30 minutes on a busy Saturday. My total cost was $35 and the storekeeper let me try the Bulova with one and then two links removed. While I was waiting, I noticed that the store had a very interesting selection of watches in a wide variety of price ranges. Some of the watches they carried included Bulova, Caravelle by Bulova, Skagen, Seiko, WeWood, and Caterpillar. There were other brands as well. They also have clocks by companies like Seiko, Bulova, and Rythm. Since I have another Bulova watch to take in for a new battery, I'll try to notice more in a couple of weeks. I had never seen Caterpillar brand watches, but they were quite attractive. The store's selection of Caravelle watches was quite extensive. They had a much larger selection of Caravelle watches than the nearby Sears. Since I think the Caravelle watch brand offers a lot of value for the money, I'll definitely file that tidbit away. The visit and service were a reminder that local brick-and-mortar watch stores are definitely worth a visit.